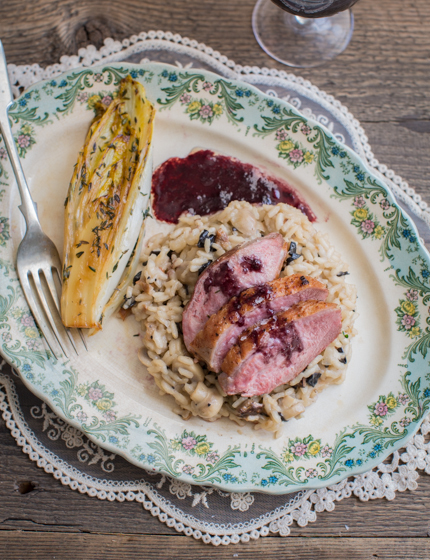 This week’s Mastercook was all about preparing duck breast with a risotto and a vegetable side. Sounds pretty easy, but the show producers had thought of a little mean twist: the contestants would have to prepare the final dish in pairs, but separately. So, one contestant would start the dish, and halfway through, the next contestant would take over and finish the dish off. Damn tough. I was lucky enough to cook my version of this dish by myself! 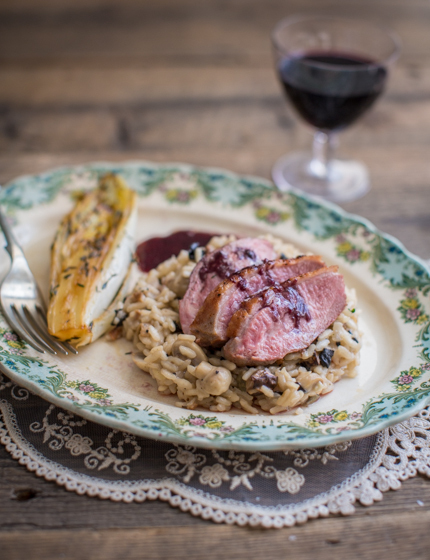 I’ve paired my duck breast with the woody flavours of a wild mushroom risotto and the lovely bitterness of chicory. Rounding it all off is a star anise-flavoured port sauce. Very lovely if I may say so myself! Put the dried mushrooms into a bowl and top with 400ml boiling water. Leave to soak for 15 minutes. Meanwhile, peel and finely chop the onion. Set half the chopped onion aside to make the sauce later. Peel and crush the garlic clove. Clean and finely slice the mushrooms. Wash the chicory heads, cut off the base and cut lengthways in half. 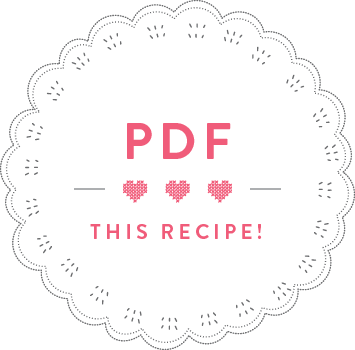 Score the skin of the duck breasts in a criss-cross pattern, making sure not to cut the meat. Start with the risotto: heat the olive oil in a saucepan on a medium heat. Fry half the chopped onion for 3 minutes, then add the garlic and the mushrooms and fry for another 3 minutes until the mushrooms start browning. Season with salt and pepper. Add the rice, stir well and fry for another minute, then add the wine and bring to the boil while stirring. While the risotto is cooking: after 15 minutes of soaking, take the dried mushrooms out of the water and finely chop. Add 200ml boiling water and 1 teaspoon powdered vegetable stock to the mushroom soaking liquid and mix well. Season the duck breasts with salt and pepper on all sides. Put the duck breasts skin side down into a cold frying pan and put on a medium heat. Once the duck fat starts oozing out of the skin, fry the duck breasts for 6 minutes on each side, lifting them up and giving the pan a swirl so that the fat can ooze out into the pan. Once the risotto rice has absorbed all the wine, gradually add the vegetable stock – always a ladle at a time, stirring between each addition and only adding more liquid once all the liquid has been absorbed. Keep covered until serving to keep it from drying out. After 12 minutes, take the duck breasts out of the frying pan, wrap in foil and set aside to rest. Pour 1 tbsp sunflower oil into a small saucepan and put over a medium heat. Fry the remaining half onion with the star anise for 3 minutes. Add the port wine after 3 minutes and leave to simmer so that the sauce reduces a bit. Meanwhile, put the frying pan used for the duck breasts back on the hob. Sprinkle some sugar over the cut open parts of the chicory heads and put cut-open side down into the frying pan. Brown for a couple of minutes until the chicory has caramelized. Lower the heat and, after a few minutes, add the orange juice and soy sauce. Cover the pan and cook for 5 minutes. After 5 minutes, take off the lid, turn over the chicory heads and raise the heat. Sprinkle with thyme and cook for another couple of minutes until the chicory is cooked through and the liquid has reduced. Once the port sauce has reduced, strain through a sieve and pour back into the saucepan, but keeping it off the hob. Whisk in 20g cold butter so that you get a thick and glossy sauce. Season to taste. Just before serving, stir the chopped wild mushrooms into the risotto, along with the butter and grated parmesan. Season to taste with salt and pepper. Unwrap the duck breasts and cut into slices. 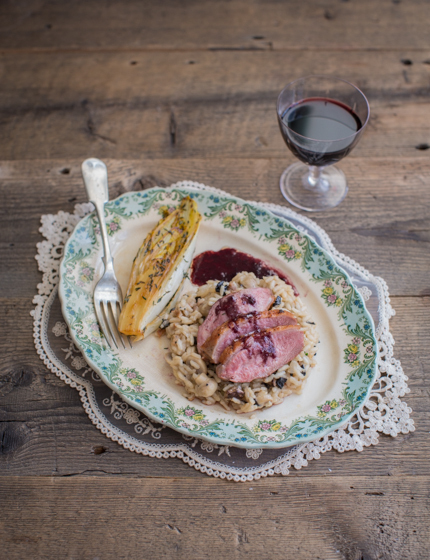 Dress each plate with risotto, arrange the duck slices on top and sit the chicory next to it. Drizzle with sauce and serve. I think duck is my absolute favourite poultry … can eat it in almost every way. Love this!